It seems that I have, as of late, started to make one recipe and ended up with an entirely different one. This past weekend was a perfect example of such an occurrence. Months ago I made a Chocolate Nutella Tart with Raspberries that was quite delicious. I took my step-by-step pictures and was very proud of this decadent dessert. I am not sure of what exactly happened, but I ended up blogging about several other recipes and totally forgot about this tart. Then I came across the pictures and thought, “I can’t wait to write about this!” Only one problem, I had not written down the recipe. A VERY big problem. Shoshana requested that I skip the Nutella because I recently posted my Espresso Shortbread Hamantaschen with Nutella Filling and she wanted a change. No big deal; I would simply substitute a chocolate ganache for the Nutella. Then I proceeded to go to a couple of grocery stores in search of raspberries only to find that they were not in stock, anywhere. As is my usual style, I went to Plan B and decided to work with strawberries instead of raspberries. The blueberries were also beautiful, so I bought some of them as well, mostly because I was still not sure what direction I was going with the chocolate tart. I bought extra strawberries because I decided to also make my Lemon Strawberry Bars, just in case my chocolate experiment failed. Good thing I did, because it was an epic failure. 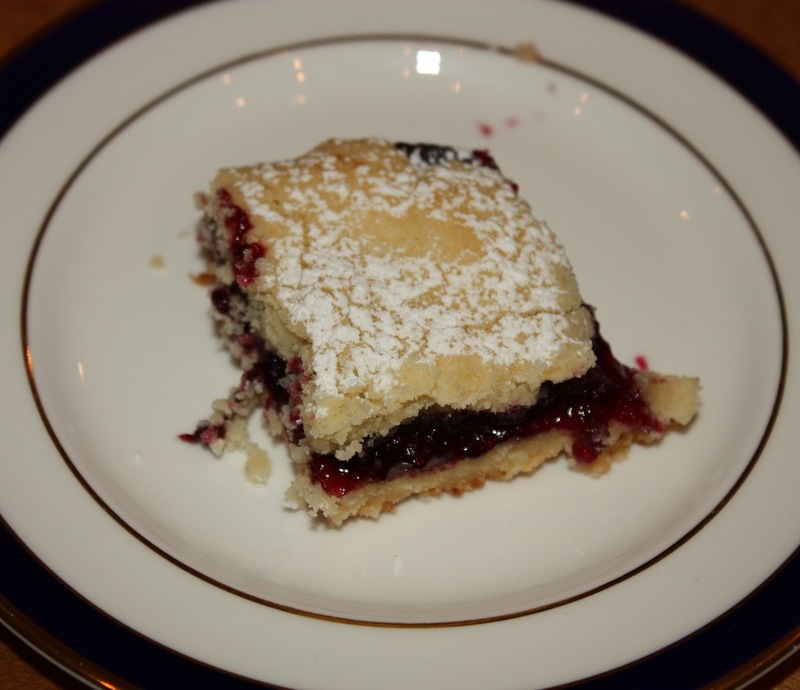 It was after eating the Lemon Strawberry Bars that I knew exactly what I had a taste for…Lemon Blueberry Bars. The next day I woke up dreaming of this dessert and immediately cooked the blueberries on the stove. Unlike the strawberries that get mashed before cooking, the blueberries cook for a bit before they get smushed (a very technical term!) against the side of the pan. The end result is a light, refreshing bar with the perfect amount of lemon balanced with a lovely blueberry filling. How did I really know it was perfect? Joshua, who loves the strawberry version, was home from college. I had some of the strawberry bars left and was planning to take the blueberry ones to Samuel’s school. I asked Joshua which kind he liked the most because I would give the other ones away. His response made me smile, as I packed up half of each so that baby boy would be able to enjoy both kinds while he is here. Joshua is here for the week. I can’t wait to see what I experiment with next or, more than likely, what dessert I end up with, knowing it will be different from what I originally intended. I know for sure I can’t ask for a better taste tester. Wash and dry the blueberries and place in a medium saucepan. Add sugar, lemon juice and cornstarch. Cook over medium low heat until the mixture is thick and translucent, stirring constantly. As the blueberries plump, shmush them against the side of the pan. Cool completely. Place the butter and sugar into a large mixing bowl. Beat for 3 minutes, scraping the bowl down as needed. Add lemon zest and juice. Lastly, blend in flour. Place ⅔ of the dough into the prepared pan and use the palm of your hand to evenly distribute the dough. Bake bottom crust at 325° for 20 minutes. Remove from oven and top with cooled filling. Top the filling with the remaining dough in one of the following two ways. The first option is to take small pieces of the remaining dough and place them over the filling, in which case some of the filling will show through. The second option is to take pieces of the remaining dough, press them between your hands and lay the flattened pieces over the filling. The filling will be covered. Once the filling is topped, bake at 325° for an additional 35 minutes. Remove from oven and cool completely. Once cool, dust with confectioners sugar and cut the bars. Either method of topping the filling will work. Decide whether or not you want to see some of the filling and go from there. Lemon Blueberry Bars are best eaten cold.